The holidays are around the corner and now is the time to take your fitness routine to the next level so that you can enjoy the holiday feasts without the guilt! Everyone has different goals (more energy, weight loss, toning, muscle building) and we want to see yours! Over the next four (4) weeks, we’ll be sharing daily workouts, healthy recipes, and encouraging ALL to participate. These workouts are appropriate for all – including beginners, but more advanced techniques will be available for those who want to take their workout to the next level! To enter the challenge, simply share your fitness journey with us on Instagram by sharing relevant photos – from healthy meal planning and engaging in our workouts, to sharing recipes and fitness pictures. 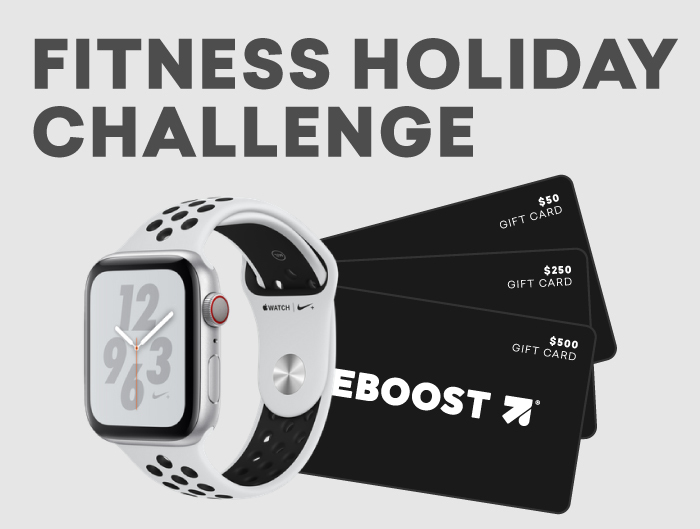 Tag @EBOOST, and use hashtags #eboost & #fitnessholidaychallenge and make sure you follow @EBOOST on Instagram. To qualify for a chance in winning these prizes, make sure your profile is public so we can see your entries. Must be 18 years or older to participate. Must live in the United States. This giveaway is not in association with Instagram, Apple, Nike, or any other brands. Improve your chances to win by posting up to 3x each day! The chosen winners will be selected randomly at the end of the challenge and will be contacted via direct message through Instagram. Tag friends who may like to win! Winners announced November 20th, 2018 via Instagram. Each day is designed for you to take each workout to your own level while being able to complete each workout right in your very own home if needed!